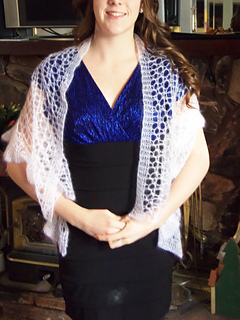 Perfect for warmer weather, this lace confection is made from silk and mohair yarn, and may be wrapped several ways. There are a 10 inch wide and 15 inch wide version. 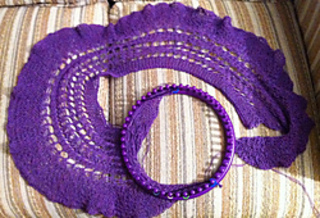 The ruffled edge is loomed all in one with the wrap. It is a treat to make and to wear. 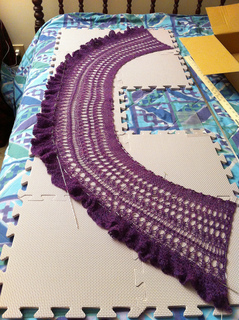 This pattern is made on a knitting loom with at least 30 pegs, 44 for the larger size. The gauge for the loom is 1/2 inch. A 5/8 inch gauge may be substituted, but the yardage should be increased. If making the Pearl with the Shibui yarn, it is recommended that the strands be doubled. If made with Aloft or Kidsilk Haze, a single strand is fine. Heavier weights of mohair are not recommended for this pattern.